The 2018 MacTrack Westernationals was certainly an event that had plenty of nail-biting excitement, especially in the 400 Thunder Championship Pro classes. 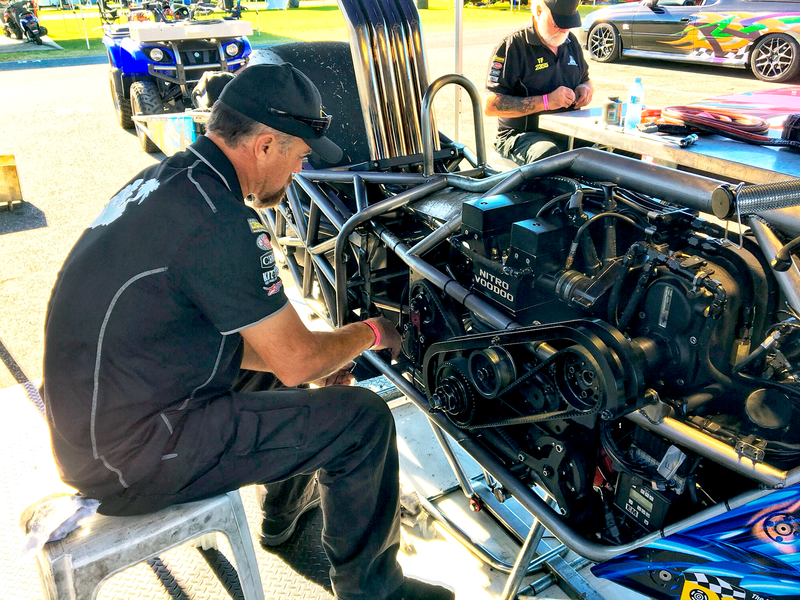 For Chris Matheson, the current Top Fuel Motorcycle champ came into the event with a to-do list and was hopeful of ticking a few boxes. 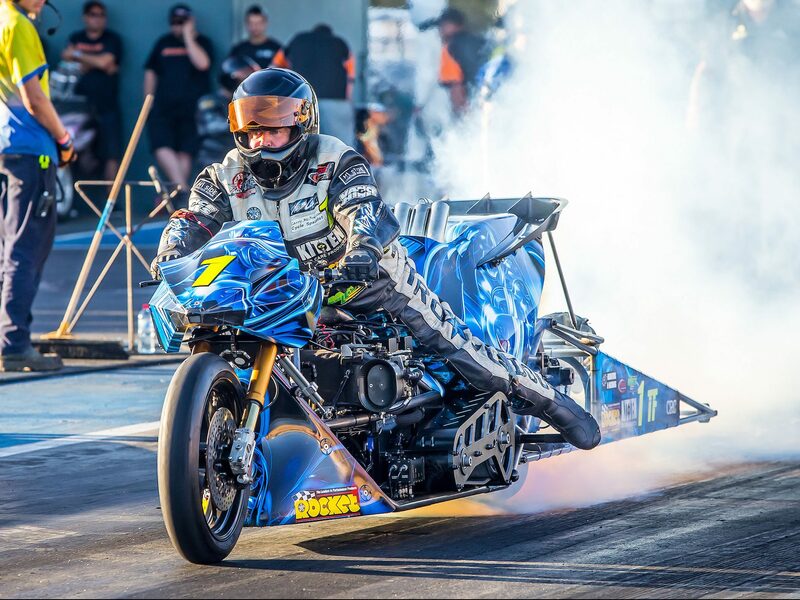 Looking to improve on his recent 6.10 ET performance from the previous round in Sydney, Matheson had his sights on breaking the current Top Fuel Motorcycle Perth track ET record held by Jay Upton at 6.11. It’s the only major track missing from his list, and with limited opportunities to make an attempt, he wanted it bad! After that, breaking his own 6.04 ET national record would be the icing on the cake. The Perth track is one of his favorites on the championship tour because it always brings together a strong field of local riders. As he was the only interstate entry, Matheson knew he had a big target on his back. “Western Australia has always given me some of the best competition,” said Matheson. For me the better it is, the harder I play. “While Mark had some issues in the last Sydney round, he’s tough and always bounces back quickly. I was also excited to see Jay Upton in the mix, as he was showing lots of performance potential during pre-event testing. “Along with the other riders, I knew I needed to be on my game. “The weather was brilliant, and the track was in good shape thanks to the staff and officials. In the first session, I was paired up with Jay. This was something that a lot of people were pumped to see, creating plenty of hype. “Unfortunately for me I broke a sprag in my gearbox and wasn’t going anywhere fast. The crew of Chris Matheson working hard. “Despite the best efforts from the crew, we missed the second session,” said Matheson. In the final qualifier, Drew came into the session holding the No.1 spot with a 6.69 ET. Matheson then snatched it off him briefly with a 6.667-time slip, before Drew returned serve with a 6.63! With seven bikes in the field, Drew scored the bye run in the first round of eliminations and ripped off a 6.61. Matheson then lined up against Les Holden in what was a nail-biter from the start. “On the launch, the bike went into tyre spin and broke my primary belt, leaving me stranded with no power,” said Matheson. Les Holden looked to be on his way to certain victory when he crossed the centerline and was automatically disqualified. “I couldn’t believe it. That was a get out of jail card right there,” grinned Matheson. 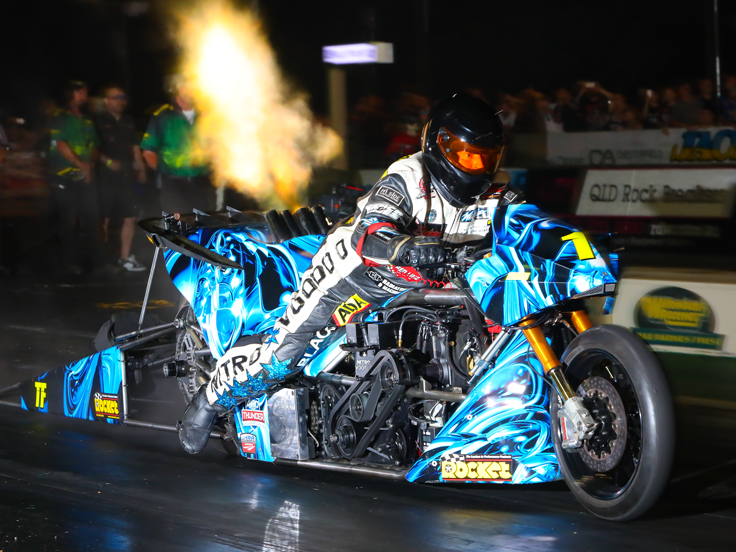 In the semifinals, the “Nitro Voodoo” magic started working with a 6.32 defeating McGuinness, while Drew defeated Greg Durack with a 6.83. The final saw Drew out the gate first but my bike started hauling and went on to take the win with a quick 6.15 ET to a 6.66. After the run, Matheson said,” I had a lot of bad luck in qualifying, and good luck when it counted. Had Les not crossed the centerline in the first round, I would have been packing up early. I’d also like to congratulate Mark for giving me a good race in the final. “I was lucky, but I’ll take it anyway it comes. My crew worked hard and got me back in the zone. The next round of the 400 Thunder Top Bike Championship will be at Willowbank Raceway on March 30 for the Santo’s Super Thunder. Matheson will go into the event with a healthy points lead, it’s his home track, and is also the place he has recorded his best ever numbers of 6.04 seconds at 241 mph [387kph]. Be sure to visit and like Chris Matheson on Facebook by clicking the banner!